Samsung has added a new big screen phone to its lineup today with the introduction of the 5-inch Galaxy Grand. The device sticks to the design language introduced with the Galaxy S III, featuring a hard plastic body and removable back cover for battery access, but it also makes some significant compromises to keep costs down. Namely, that huge display sports a modest WVGA 480x800 resolution and 186ppi pixel density. The rest of the specs look a little more promising. The Grand is powered by a 1.2GHz dual-core processor with 1GB of RAM and 8GB of internal memory expandable through a microSD slot. There's also an 8MP rear camera offering 1080p video recording and a 2MP front camera for 720p video calls. On the connectivity front you're looking at Wi-Fi 802.11 b/g/n (2.4GHz), Wi-Fi HT40, Bluetooth 4.0 + LE, A-GPS, Glonass and DLNA -- 4G LTE support is notably missing. All the usual set of sensors are present too, including an accelerometer, light and proximity sensors, gyro sensor and a digital compass. 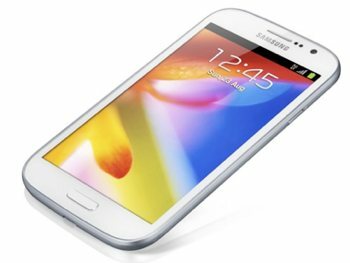 Available with the latest Android 4.1.2 'Jelly Bean' mobile operating system out of the box, the Galaxy Grand will be sold in both single-SIM (GT-I9080) and dual-SIM (GT-I9082) variants. The latter is dual-SIM active, which means it is possible to receive calls on either number at any given time, even simultaneously. Samsung didn't share any details on pricing or availability.